Can you tell us a bit about yourself and your business? I am Greta Moffett, the Founder and Fashion Designer of White Dress Bridals, LLC operating under the trade name White Dress by Greta Kay. My fashion label is Greta Kay and White Dress by Greta Kay is my flagship showroom and design studio located in Waynesboro, Virginia. In 2012, I was working in sales for a large national corporation and also doing design work for their collections. I wanted to transition into design full time as I felt it was my true passion. I left my corporate job in the spring of 2013 and decided to go all in with developing my own label and a business plan. In 2014, I launched my first collection at Virginia Fashion Week. In the Spring of 2015, I quietly opened the doors of my flagship boutique and then had a grand opening celebration, The White Dress White Party in August that included both professional and local models showcasing my collection on a red carpet runway. Why did you choose Waynesboro? I could have chosen anywhere to open my flagship store, but Waynesboro is home to my family and me. It seemed like the perfect idea to develop and grow my business in the community in which I live. Yes, there were naysayers along the way that have said that I would have to move to New York City or “you can’t do that here.” I love proving them wrong. With technology, we can live anywhere and work in a global industry. What was your biggest challenge getting started? Fear of failure is the hardest thing to move past when starting a new business. All of the “what ifs” that you imagine in your mind can really hold you back. The key is to be confident in your business plan and to ignore the voices that tell you can’t do it. Of course the financials are always in the forefront of new business planning and development. It is costly to design a fashion collection and fund a brick and mortar boutique. That is amplified as I move my brand into the regional and national market. What do you wish you had known before you started your business? Every day is a learning process in a new business. I don’t know that I would change how I would have done things, but I am always learning from what works and what doesn’t. It takes that first year in business to iron out the wrinkles and streamline processes. It is always evolving. What has been your biggest reward? I feel so fortunate to work in an industry that simply makes people feel good. 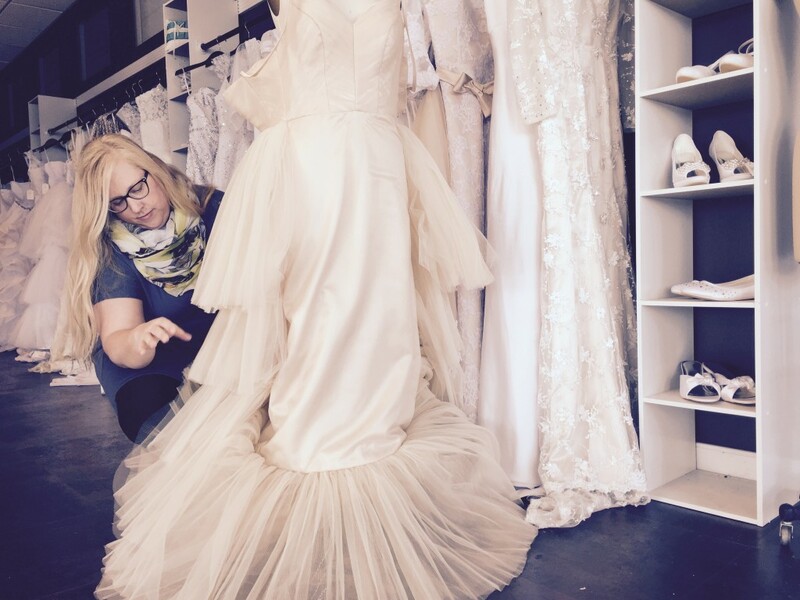 I am truly honored every time a bride selects a Greta Kay design for her dream dress. Brides put so much time and thought into every detail of their wedding. I love hearing their love story and connecting with them on a personal level. The greatest reward is watching them put on their one of a kind gown that I created and look in the mirror. They can’t hide their emotion. To witness that moment is so special. I get to make her feel beautiful on her big day. Probably my career highlight so far has been that very first fashion show with my collection and my label walking the runway at Virginia Fashion Week in 2014. To be named the Emerging Designer of the Year at my first runway show was very exciting and it gave me the confidence to move forward with my brand development. Most recently, I was awarded the Fashion Innovator of the Year title by Fashion Design and Art Week at a featured designer showcase at Artworks in Richmond, Virginia. To learn more about small business grants and training opportunities available to new Waynesboro busineses, visit us online here. We’re committed to keeping the entrepreneurial and small business spirit rolling in Waynesboro, with the inspiration of projects like White Dress by Greta Kay. It’s so heartwarming to see you in print and makes me proud to know you as a friend & industry professional when I see what you’ve achieved and why you chose to be based in Waynesboro. All the very best for a long & successful future.